Explore how writing, art, and culture collide in this special workshop guided by internationally recognized artist Victor Ekpuk! From this interplay, Ekpuk re-imagines graphic symbols from diverse cultures to create his own personal style of mark making. The Nigerian-born, D.C.-based artist will discuss his own art and its inspiration from traditional Nigerian writing systems. Then, you will examine symbolism in your culture, make personal glyphs, and create a masterpiece unique to you. 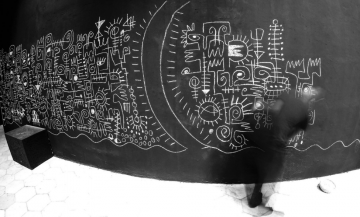 Ekpuk’s artistic practice began as an exploration of nsibidi, a classical Nigerian writing system that uses symbols and graphics to convey ideas. His practice has since evolved to embrace a wider spectrum of meaning rooted in African and global contemporary art discourses. 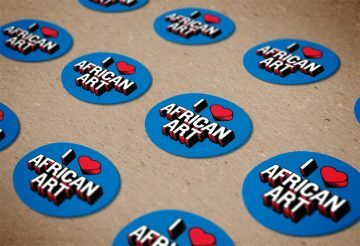 Ekpuk’s work is included in the collections of institutions like the Newark Museum in New Jersey, Dartmouth’s Hood Museum, and the University of Illinois’s Krannert Art Museum, as well as our own National Museum of African Art. He has exhibited widely in both solo and group exhibitions. Don’t miss this rare chance to create art with a renowned artist! This workshop is presented as one of three special editions of the museum’s Workshop Wednesdays. (Click here to see the full listing of drop-in Workshop Wednesdays.) These masterclasses will offer the special chance to explore select artistic topics more deeply and learn from the same artists whose work you see on our walls and in our incredible collections.